A new, interesting and innovative concept by Liese on DIY Hair Dyes. Instead of the traditional comb and dye mixture, this one foams up and allows you to massage the mixture into your hair like as though you're shampooing it. 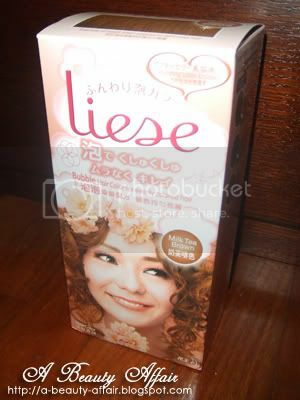 Thank you Liese & Cozycot, I got the Milk Tea Brown to try out but I've done my hair just recently. First photo was taken on the airport express upon arrival. Second photo was taken on the 4th day of the trip. Can you see how tanned I got! Amazing, right? I finally got down to using it a few months back. 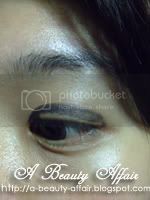 But the color was so close to my base color, noone could really tell the difference except for a colleague whom I work closely with. Anyway, I still prefer getting my hair done professionally instead of going through the hassle of DIYing. But I'll still give credit to this product as its unique bubble up and foaming method does help in spreading the color more evenly as to those traditional hair dyes with the comb. Still, the idea of putting a plastic sheet (made out of a plastic bag) around my shoulders and getting my hands dirty is not exactly my cup of tea. To the salons for me! 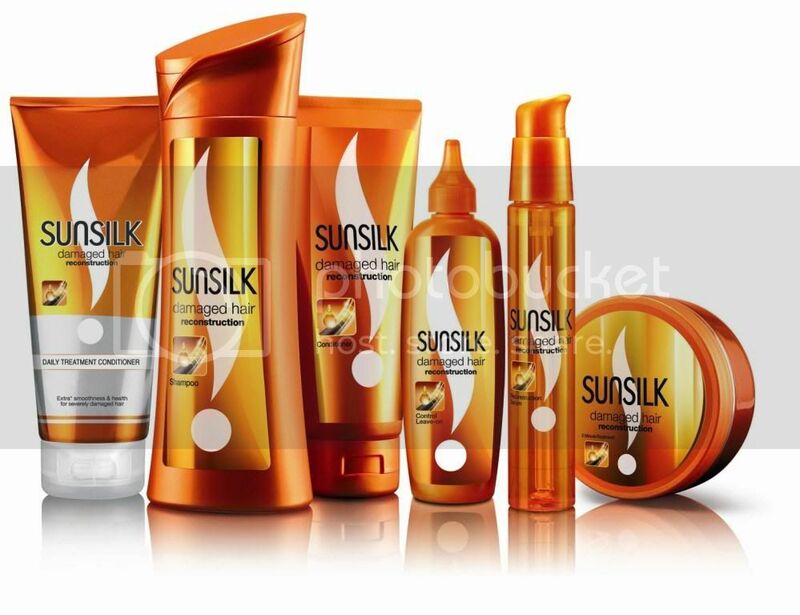 "SINGAPORE - Haircare brand Sunsilk has partnered with airline Jetstar Asia to promote its newly launched damaged hair reconstruction range. As part of this partnership, air stewardesses on-board Jetstar Asia and Valuair flights starting from Singapore will give a live demonstration of the brand’s new range of products. The activation, which will continue until September, is part of a recently launched campaign, which consists of a TVC, OOH, print and online. 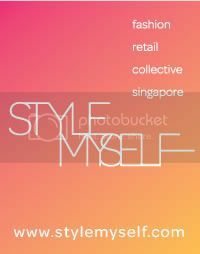 A website specifically targeted at Singaporean women has also been launched to support the campaign. Tina Koh, brand manager of home personal care at Unilever Singapore, said that the brand hopes to create a unique and distinctive experience for consumers to interact with the new range of products. Chong Phit Lian, CEO of Jetstar Asia and Valuair, argued that it is a win-win for Sunsilk and Jetstar passengers. “One need not miss new product launches now even while during air travel,” he commented. The trial kits of the new products will also be handed out to all female passengers on-board. " They had this new campaign in JUNE and it's no wonder, I heard the cabin crew giving a short intro on Sunsilk products on my Jetstar flight back to Singapore BUT so unfortunate for me, there weren't any trial kits given out!?! 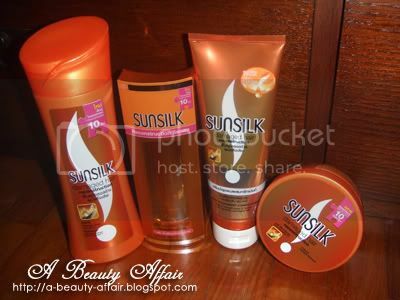 Apart from Silkpro, I love Sunsilk hair products as I feel that they do work for me and are very reasonably priced. 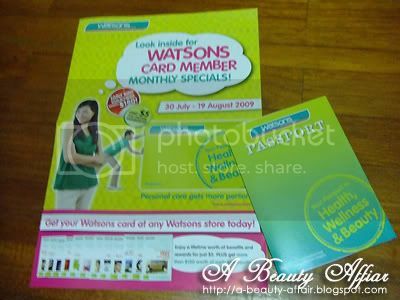 Thanks to Sunsilk/Unilever and Cozycot, I'm given the opportunity to try out part of their latest range in retail size! As you can, comparing the first photo and this one, I'm missing out on the conditioner and the leave-on conditioner. Anyway, I have really damaged hair, hair that has been dyed and then rebonded and then dyed again. So really, I can't wait to start using this as it promises to restore damaged hair in 10 days time! There's also this virtual salon as part of their whole new campaign, where you'll be educated more on this latest range and also request for a sample kit. This is a makeup remover which I've been dying to try. It removes makeup even better than my favorite ZA foaming cleansing gel! I'm sorry ZA but move aside for the Mandom Cleansing Express Moist. 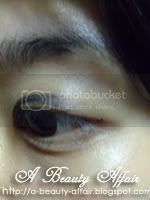 This photo below shows me with eyeliner on after removing my false lashes. After leaving on a cotton wool piece with the cleansing lotion on it on my eyelid area for 3-5 seconds and a quick swipe, the makeup is gone! I did not even need to rub it off or whatever. this, it comes off without much effort. Removing makeup is a breeze with this cleansing lotion. Paula Begoun: Do toners tone? In reality, toners—also referred to as astringents, clarifiers, refiners, fresheners, and tonics—don’t tone anything. At least not by the dictionary definition of “tone,” which refers to the “normal firmness of a tissue or an organ.” The term “toner” is a caprice invented by the cosmetics industry and, therefore, it can mean anything they want it to. I have heard that toners do everything from balance the skin and close pores to deep-clean and prepare the skin for other products. They do none of that. In fact, toners of any kind do not close pores, they do not deep-clean pores, and they do not reduce oil production. If toners could do any of that, given the repeated daily use of these items by most women, who would have a visible pore left on their face? There are no ingredients in toners that can firm skin and return it to its normal state. What well-formulated toners can do is help reduce inflammation, add antioxidants, skin-identical ingredients, and cell-communicating ingredients to skin, soothe skin after cleansing, help remove any last traces of makeup, and impart some lightweight moisturizing ingredients to skin. All of those things can have a beautiful, significant impact on the appearance of your skin and can make a huge difference but you still haven’t “toned” anything. Nevertheless, the word “toner” has stuck and is commonly accepted by consumers which is why it is used so often in the cosmetics industry. Regrettably, not all toners are created equal, and many are terribly formulated, especially those containing alcohol, meaning they have a real capacity to cause irritation, redness, and dryness. No matter what toners are called (astringent, freshener, pore cleanser, clarifying lotion, witch hazel, and so on), and whether they are inexpensive or expensive—if they contain irritants they are bad for skin. When toners don’t contain irritants they can still fall flat when they are poorly formulated and lack any real beneficial ingredients for skin (such as antioxidants, skin-identical ingredients, or cell-communicating ingredients). Your toner should not only be free of irritants but it should also be filled with state-of-the-art ingredients for your skin. If they’re not, why bother (especially if the toner you’re considering is expensive)? It is best if the toner is fragrance-free, but those are hard to find. I am also pleased to state that all of the toners in my Paula’s Choice line meet the standards outlined above for what a state-of-the-art toner needs to be effective for skin. Summary: Many irritant-free toners are a fine alternative as an extra cleansing step after cleaning the skin with a water-soluble cleanser. Toners won’t close pores and they won’t deep-clean, but depending on the formulation they can leave the face feeling soft and smooth, remove the last traces of makeup or oil, reduce or eliminate irritation, provide antioxidant protection, soothe the skin, and lightly moisturize skin. For some skin types, a toner can be the only moisturizer you need to use (especially during summer). Basic directions: After cleansing the face, soak a large cotton ball or pad with the toner and gently stroke it over the face and neck. Do not rinse. 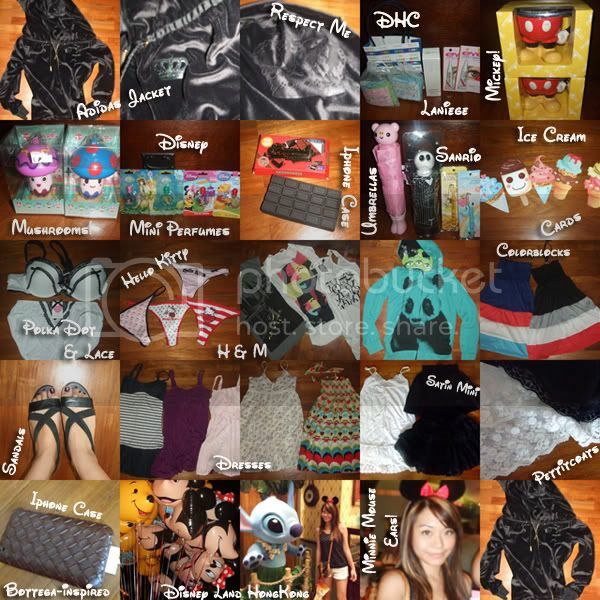 I'm totally broke now and I'm selling away some BRAND NEW IN SHRINK WRAP items. and John Little are always MIA whenever I reach after work. I've not been updating as I've just got back from Hongkong. alot of skincare products. Enough to last me till 2011!!! 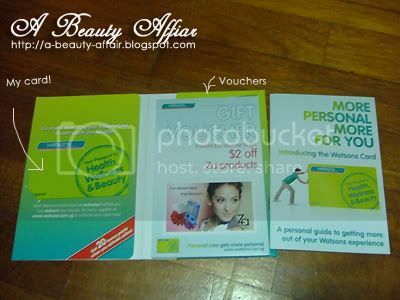 For beauty products, I only managed to grab 2 packs of DHC samples. Thanks to Jess's discount, I got 10% off. I also got 3 tubes of BLACK false lashes glue. It's so difficult to find BLACK glue in Singapore! And my star buy would be the LANIEGE Hydra solution essence. I went to the store and it was going for around Sgd70 after conversion. Then I found it at Bourjous which is like Singapore's SASA too. There was a discount and I paid only Sgd44 for it! 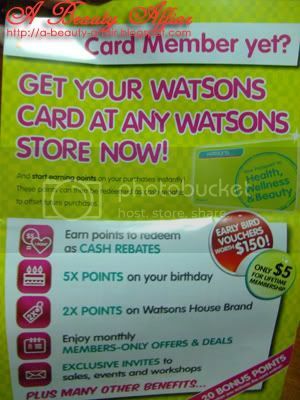 Every drugstore junkie should get a Watsons membership! You'll get to earn points and a whole load of other goodies!!! most of the other drugstore junkies have already gotten theirs.